First of all, I thank my fellow blogger and altogether excellent friend who explained this episode’s title to me. This title and the one from last episode remind me of Lost with its polar bears and planes and boats and other means of transportation, and I am sure a helicopter is in there somewhere. It’s my own personal joke that some of the disappeared have boarded an Oceanic flight and have crash-landed on a strange island. Which is not a complete coincidence, because Lost as well as this series are master-minded by Damon Lindelof. Lost was co-created by him, whereas Leftovers has its origins in Tom Perrotta’s book of the same name. 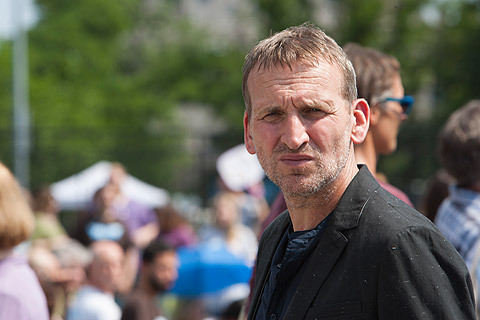 Fans of Christopher Eccleston have reason to rejoice, because this episode is mainly about his character Matt Jamison. We’ve already seen him handing out leaflets at Heroes Day, and he and Nora Durst seem to be friends. My impression that he is a man of the cloth are confirmed in this episode. He is a dedicated Episcopalian priest, his wife Mary got severely hurt in the car crash from the pilot episode and is now in a waking coma. The pews in his church are far from full. His take on the disappearance is that it was not a rapture: some of the disappeared were bad people, and he feels he must distinguish the sinners from the good people by printing leaflets about the crimes of the former, and people need to know. Some of them feel compelled to punch him, and some will. Observe the pit boss at the casino – he has Matt’s whole appearance figured out in two seconds. Matt is broke personally, and his church is threatened with foreclosure. To him, that might be the same thing. Nora Durst is willing to help him on condition that he stop printing his leaflets. He replies by telling her that her husband Doug had an affair. Some people are better off not knowing everything about their loved ones, but there you go. Nora seems… relieved. Matt lies down to sleep beside his unresponsive wife when he has an idea from above how to get money to save his church. He drives to Kevin Garvey’s house, where Garvey Sr. has buried a jar some time ago with a wad of money for Matt (which hints at another, older story). It’s interesting that he sees Laurie sitting on a swing in the backyard of the place she once called home; apparently she’s there for old times’ sake, but asks Matt to not tell anyone. That might work because Matt is not supposed to be there either. He takes the cash to the casino, where he keeps winning. I could go on about the plot, but that’s a thing that I will leave to the viewer to discover. Let me just say that it is a terrible thing to see a man’s dedication turn into hate. If I remember correctly, Lost often dedicated one whole episode to one of the main characters. This third episode works the same. I have to say I quite like it, if only because I don’t have to remember at which point we’ve left this or that character. There are a few characters who can carry the series on their own, and I hope we get to see a whole episode about Nora Durst or about Laurie Garvey. My guess is that there will be a point at which we get to know more about what happened on that fateful October 14 – a metaphorical hatch buried in the ground, if you like. But not yet. Let the characters evolve. For now, following Father Jamison on his odyssey has been the series’ highlight. I’d like more of that, please.